These lessons, begun with rather indefinite purpose in a series of magazine articles under the pseudonym of Prof. Polychrome, expanded, during the first year, into a fairly complete exposition of the fundamentals of vocalization. During the past year a second series of articles has been undertaken with the view or rounding out the first, and completing a practical system for students of singing. The main features of the second series are added to the first to make up the present work. The aim has been to describe the principles and practice of voice culture simply and exactly, using terms that can hardly be misunderstood, and providing, as far as possible, against the errors which so often thwart the ambitions of students, leading them to a deplorable waste of time and energy. How well I may have succeeded in this is now left to those to judge. Prof. Swell the note again, and instead of pressing so much with the breath as you make the crescendo, try to push the tone against the bridge of the nose by an effort in the head back of the nose. In other words, make the tone feel nasal, though it must not sound nasal. It must, however sound rather thin and forward, and the vowel e must became quite acute or very exact. Do that at different pitches, and try to realize something of this effort at resonance, which is made up in the head. Sop. I don't seem to get it at all. Prof. You get very little of it, but it is extremely weak at first. Ten. I do not feel the sensation you describe. My effort seems to be somewhere here (indicating his throat just beneath the angles of the lower jaw). Prof. This action which I am describing to you is at first so vague and weak that the adjacent parts—throat, jaw, lips, etc.—all try to assist. These become more or less rigid, and you feel them more distinctly than you do the desired action higher up. But these, especially the jaw, must be kept devitalized. Try the swelling tone with e again, keeping the lips perfectly motionless, and allowing no rigidity of jaw or throat. The tongue alone must appear to press forward a very little during the crescendo. Alt. This is all very vague to me, Professor. Prof. That is always the case in beginning this subject, but it is a step. Others will follow. Take each one as well as you can, though it be with uncertainty. The Polychrome Lessons in Voice Culture (1896) by Frederic W. Root, 24. Ten. Then where does the strong vitalizing come in that you speak of? Prof. It comes in the process of resonating. Ten. But you say that that should be done in the head. Prof. That is where the sensation is, although the fact is that resonating is done in the throat. Ten. Then the throat for singing must be both vitalized and devitalized. Prof. Yes; the functions of the throat are diverse; some of its actions favor tone and some oppose it. Ten. How easy it must be to get things confused—vitalizing and devitalizing the throat at the same time. Prof. Ninety-nine people out of a hundred do get this matter very much confused in singing. But there is a beautiful provision of nature which enables us to perform the act of vocalization without confusion; and that is that all of the throat muscles which may properly be vitalized have little or no sensation in the throat itself. The prominent sensation accompanying the effort of these parts is in the head mostly behind the bridge of the nose. This leaves us free to apparently devitalize the whole throat on every tone of the scale, high or low, and so preventing cramping of the vocal organs, which is the bane of singing. Alt. What is it that one must do behind the nose? Prof. Resonate the voice. As I told you, the action is really in the throat. What is done, however, in correctly resonating the voice, imparts a distinct vibration to the bony structures of the skull, giving a sensation of tone generally at the place which you mention, behind the nose; although with some this sensation of tone which arises from correct resonating is more distinctly felt at some other place, as at the hard palate behind the front teeth, or in the forehead between the eyebrows, or at the top of the head, or in the cheek bones close to the ears, or even at the back of the neck. Prof. Not at all. The process of resonating is always the same; but just where the effects are felt most distinctly is a matter of individual peculiarity. Bas. But you speak of effort behind the nose; and from what you now say it seems that the effort is elsewhere. Prof. Yes; here is one of the places where the facts are different from their sensations. In this case, for the purpose of teaching, we must deal solely with the sensation, the fact being accessible only in this way. In order to stretch this rubber band to exactly one foot in length, I need not think of the muscles of my hands and arms which really accomplish the result. I can be guided almost entirely by the sensation of sight, and the muscles will do their work without having thought bestowed upon them. Bas. Then there is no effort behind the nose, really? Prof. I do not say that exactly. The muscular tissue running from the bone of the skull down to the region of the soft palate and the larynx, may in their action be vaguely felt behind the nose; but the main source of the sensation which you have in the head is that combination of muscular action which causes the larynx to impart decided vibrations to the spinal column. Sop. Please explain that to me again so that I can tell my pupils about it. Prof. Don't explain it to them at all. Not one pupil in a hundred need know about these things. 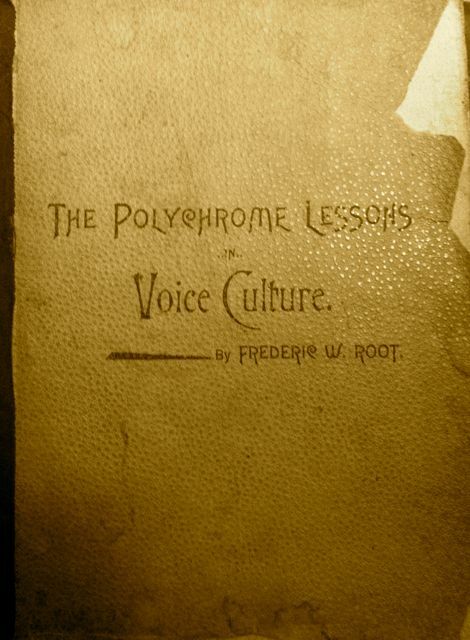 The Polychrome Lessons in Voice Culture (1896) by Frederic W. Root, 91-93. Ten. Are you nuts? The facial muscles have nothing to do with creating tone in the larynx. This is charlatanism of the highest order. Really. Someone should take your NATS membership away! Alt. Could you please turn the squillo down a bit? I can hardly hear myself think. I'd like to hear what the professor has to say before you burn him at the stake. Prof. You are right, Tenorinomio. The facial muscles in and around the nose don't do anything, that is; you can't move the muscles of your face in order to change how the muscles of the larynx function. Lucie Manén was off-the-mark when she suggested this in her book The Bel Canto: The Teaching of the Classical Italian Song-Schools, It's Decline and Restoration (1987). No, that's not how it works. Ten. Ok then. How does it work? Prof. There are two things to keep in mind; one historical, and a matter of pedagogy; the other a matter of psychoacoustics. In the first instance, you may remember that I studied with Luigi Vannuccini in Florence, who's principle method was "keeping the pupil's attention directed towards the region of the eyes and nose in forming tone." His teaching is also that of Lilli Lehmann, who, in her book How to Sing (1914), writes that the singer should feel as though a "saddle" has been placed over the nose. Jean de Reszke also expresses this idea when he says "the voice is an affair of the nose." He takes a lot of heat for that, let me tell you! Then there is my colleague in Berlin, Madam Schoen-René—a student of Pauline Viardot-García and Manuel García (whom I recently visited); she teaches it as well, as do many of her students, but it has been a matter of dispute for many years, since no one has divined its true cause. Ten. So you think psycho-something-or-other explains it? Prof. Psychoacoustcs is the scientific study of the physiological and psychological responses to music and speech. I've been speaking with this gentleman—a French ENT—who spent most of his life studying the connection between the ear and the voice. It seems that the nerve of the face and neck insert into the middle ear. He tells me that when the ear is innervated, the muscles of the face, head and neck respond in a way that is hardly noticed by most people, except voice teachers, which is why my colleague Harry Gregory Hast, intoned: "You will never get a bright tone with a dull face!" Sop. Oh, dear me. No wonder I sound terrible today. I've been in a foul mood, haven't I? Prof. You have my dear, which can make a big difference, as least as far as the ear is concerned. According to this French fellow; when the ear opens, so does the face. And you've been frowning since you came in. Of course, screwing up your nose or grinning like a banshee has little to do with opening the ear. This feeling of the vowel starting from behind your nose must come from inside your ear. Properly speaking, the nose has the least to do with it, which is why Manén missed the mark. The nose simply represents the center of activity: the muscles of the head and face being—as one famous vocal pedagogue said—"busy." It may sound strange to say, but intention makes for movement, rather than movement intention. Once the horse is out of the barn, all bets are off. The difference is between the man who insincerely moves his mouth into that most familiar shape with dead eyes talking, and the man who beams when running to meet his lover. One can see as well as hear the difference. What the singer feels, the cranky accountant can only imagine.